As most of you know, Joshua and I are following Dave Ramsey to aggressively pay off debt. We have been on Baby Step 2 in the debt snowball for the past 20 months, and this guest suite was one of our splurge projects. One of our unified values is to host people well in our home, and invest in that area of our lives. 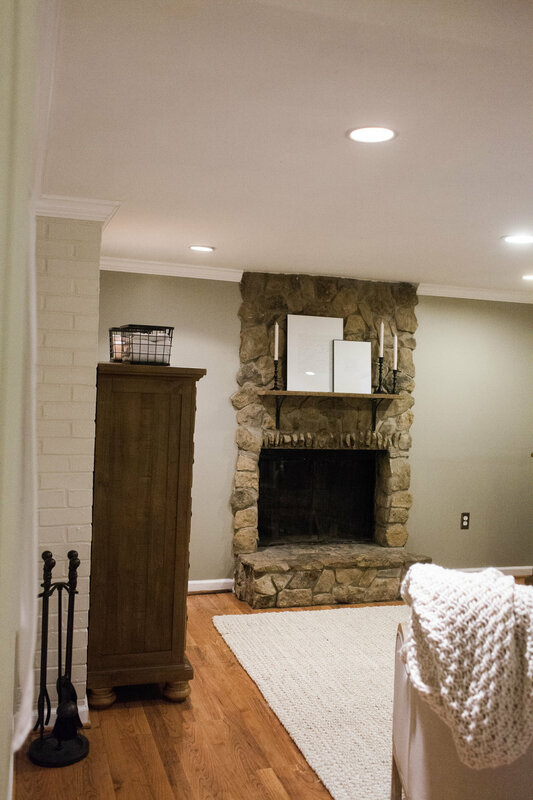 We moved into this rental home in April of 2018, and the first time I saw this basement, I instantly had visions for it. However, now that we rent, we knew it would take some time to get our landlord on board. I couldn’t stand the school bus yellow walls that made the floor look orange, the holes in the ceiling along the tops of the windows, the holes along the walls of the fireplace, and the fact that this space was completely unusable. Josh told me at the beginning of this project that he had zero expectations that this room could be turned around, but I told him to just trust me. I am so glad he did! Because we rent, we had to get the colors approved by our landlord, + we had multiple limitations with the walls, what we could hang on the walls, etc. It was a fun challenge to work with the accent wall color she picked out. We used to get a TON of cricket spiders in this basement, and it made this space dreadful to go down into. To combat the cricket spiders, we purchased a dehumidifier to eliminate the muggy and damp air that was always down there, Josh sealed up the holes in the ceiling above the windows, he sealed up the holes along the sides of the fireplace, he sealed up the hole in the wall above the air vent in the ceiling, and we put a large piece of acrylic at the fireplace entrance behind the wire mesh to keep the cricket spiders from coming in from the fireplace. And you know what, we have not had ONE cricket spider since! Praise the Lord! Most of you know this, but my husband is a Business Analyst for a software company, and he travels a lot for work. Wouldn’t you guess that the week that ALL of our furniture was delivered, he was on his LONGEST trip in Canada. When he left, the room was completely empty, and when he came back, the room was completely finished. It was a whirlwind of a week handling all the deliveries and furniture on my own, but isn’t that what women do? They just find a way?! I wish you could have seen me in my business clothes on my lunch breaks attaching furniture to our dolly, and hauling it downstairs! The surprise on his face though when he finally came home on that Saturday night was well worth the wait and the big reveal! So, drumroll please: I OFFICIALLY welcome you to our own Craft BNB (Bed N Basement…unless you stay for a Saturday morning, then it will be a Bed N Breakfast!). I hope that this transformation shocks you JUST as much as it did us, and our landlord. We pray that it is a blessing to us, and to the family, friends, neighbors, and strangers the Lord brings into our home. This blessing is not ours to keep to ourselves, but the Lords for us to steward well. One of my favorite corners of this guest suite is probably the least exciting from the outside. My dad is a carpenter, and he is the man who taught me the joy of bringing beautiful things to life from my mind with my hands. These 1920’s antique book pages remind me of days when I was a little girl where I would watch my dad create beautiful homes in drawings and then bring them to life with his hands. From the title page starting point of a blueprint proposal, to the rough drawings, to the building and final product of a new home, the entire process is just beautiful. This corner tells a small part of my story that has made a huge impact on my life. This banner is an LKC original design, and hand calligraphed by yours truly. I hated this little shelf in our guest suite, so instead of making it work, I decided to cover this hole in the wall with a custom banner that shares core values of our life with those who stay in our home. If there is ONE thing I want people to know when they stay with us, and then leave, is simply Jesus. l want them to intimately know, and be intimately known, by Jesus. I would love to order my own custom LKC fabric banner! So, I have to give Josh ALL the credit on the idea to hang LONG curtains in our tiny little windows. One, these windows are very weirdly shaped, and it would have been very expensive to get custom curtains. Two, it creates height in this space, and makes the room look taller, and not as short. Always work to create height in your spaces in the unexpected ways. Get out of the box and just try something new! To the REAL MVP of this guest suite remodel, here is to YOU Joshua Steven Craft. 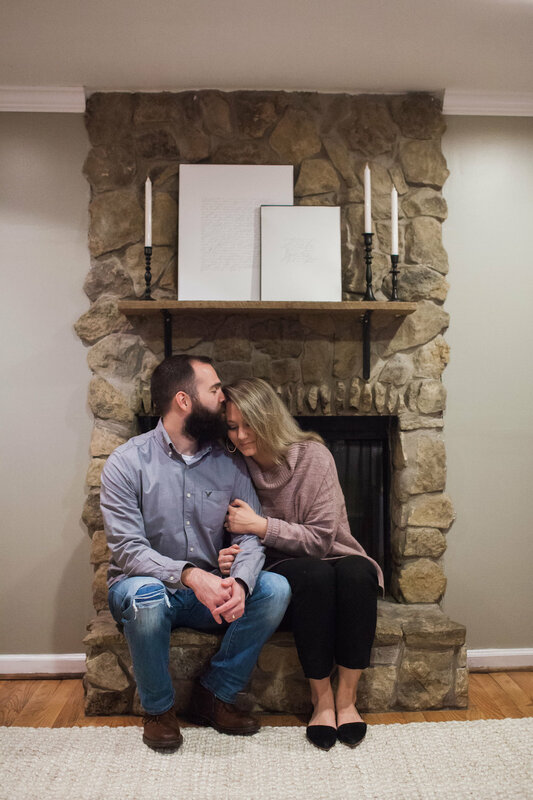 I couldn’t bring my dreams to life without your brawn and problem solving mind, and I cannot wait to create many more home spaces together with you in all the days we are given together. I love you. 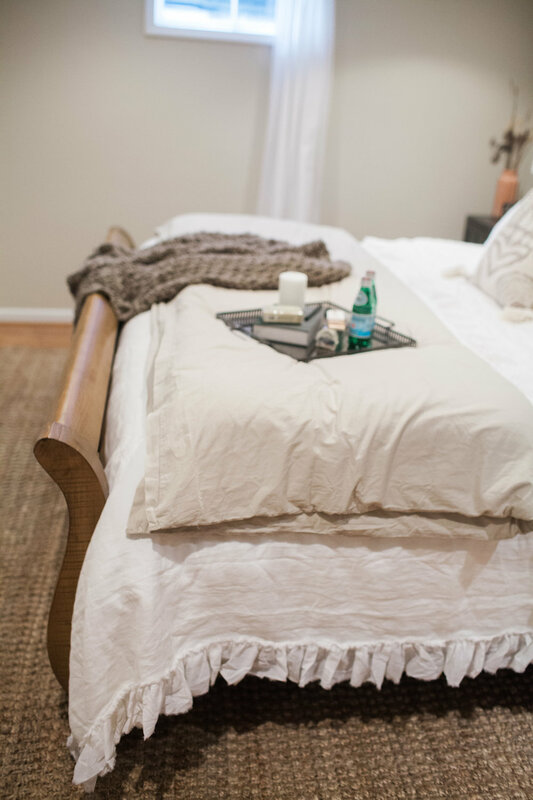 Lastly, thank you to the sweetest gal, Allie Thaxton, for these beautiful photos of our new guest suite so that I can share this reveal (and of course the next Journal Post on ‘19 Ways to Create an intentional Guest Suite’) with you! It takes a village of creatives to bring to life beautiful things, and I am grateful for my growing tribe! She made a dark basement with two little windows of natural light look like a million dollars. 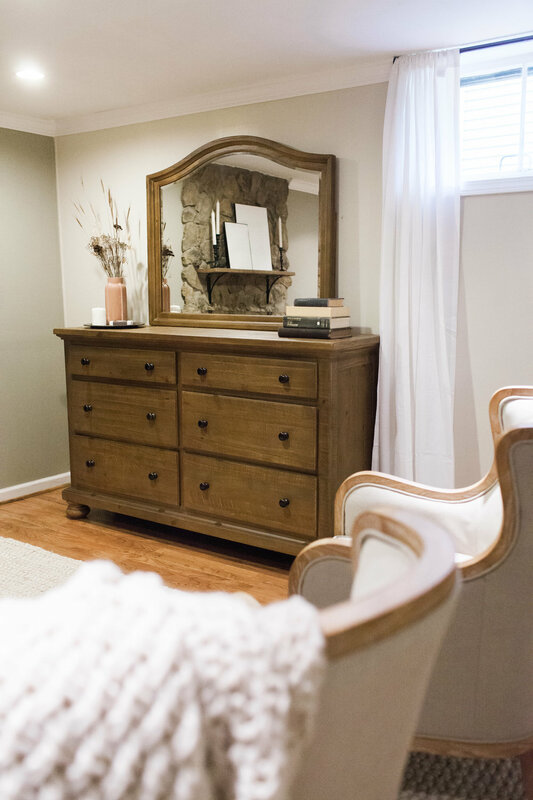 I hope you absolutely loved journeying this guest suite remodel with us, and dont be afraid to let me know what you think. I hope this inspires you to tell your story well through the home you create. Make it yours, and make it count. All we get is this one life to live. P.S. 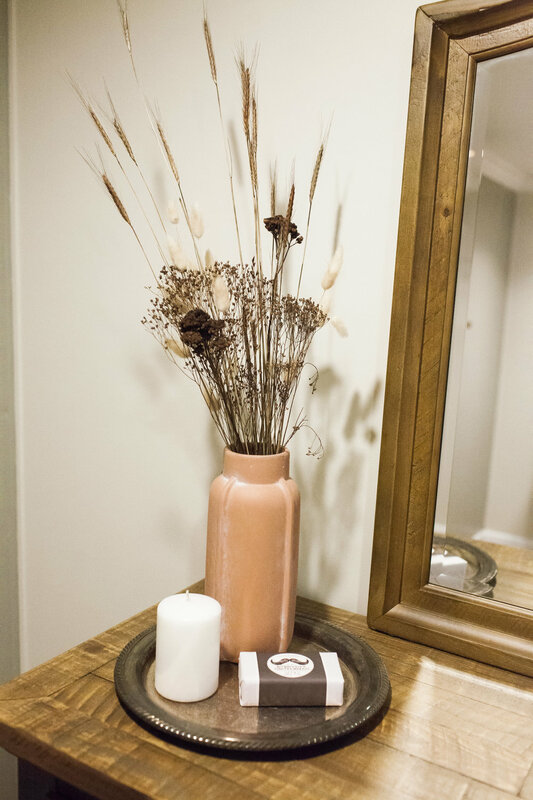 Below, you will find all of the details on where we found all of the pieces for our guest suite. Some pieces are older, so I tried to go back and find them all! I hope this helps you host well over the holidays too, and get your own inspiration for your holiday hosting and remodels. Mattress: Nectar (Comes with two free memory foam pillows, and a one year money back guarantee. Calligraphy || Letter and Knot Co, yours truly! What is it like to attend an LKC Calligraphy Workshop?